In large bowl, toss all ingredients. 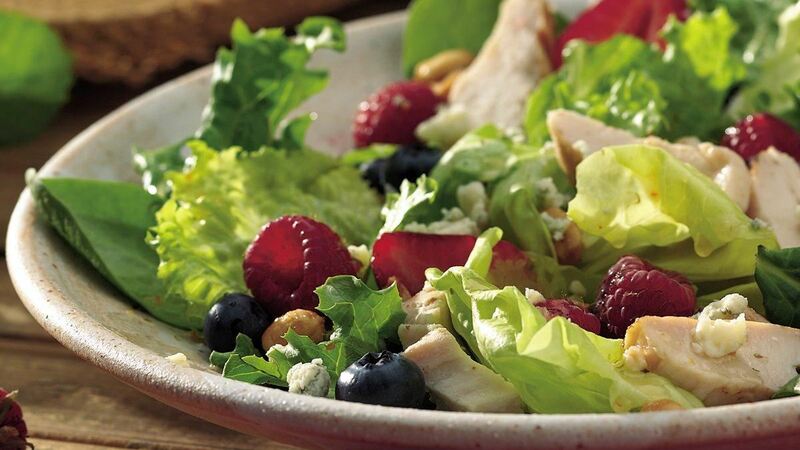 Substitution: If you prefer a fruitier flavour, you can use raspberry vinaigrette in place of regular vinaigrette. The salad, however, will have pink overtones. Time Saver: Summer is a great time to use all the different varieties of garden greens. If you're looking to save time, though, use 5 cups from a purchased bag of torn mixed greens. Special Touch: Blue cheese lovers will want to add more blue cheese to this salad. Sprinkle crumbled cheese over the top before serving.